Sunna Design, SOKOYO Solar Group, Philips Lighting Holding B.V., Omega Solar, Urja Global ltd., Solektra International, VerySol GmbH, Dragons Breath Solar, Bridgelux Inc., Solar Street Lights USA, and Sol Inc.
Transparency Market Research (TMR) conducted an adept research to forecast the potential and prospects of the market over the period from 2017 to 2025. The research report states that the market is expected to grow at a CAGR of 23.4% over the forecast period, successively reaching a market value of US$22.30 bn by the end of 2025 as against a value of US$3.47 bn in 2016. Based on application, the commercial is expected to hold 68.2% of the market share by 2025 outdoing the industrial and residential segments. On a geographical footing, Asia Pacific has shown sparks of excellence by registering a total revenue of US$1534.8 mn in 2016 and accounted for a market share of 44.3% the same year. The region is expected to exhibit positive trends within the market over the forecast period. 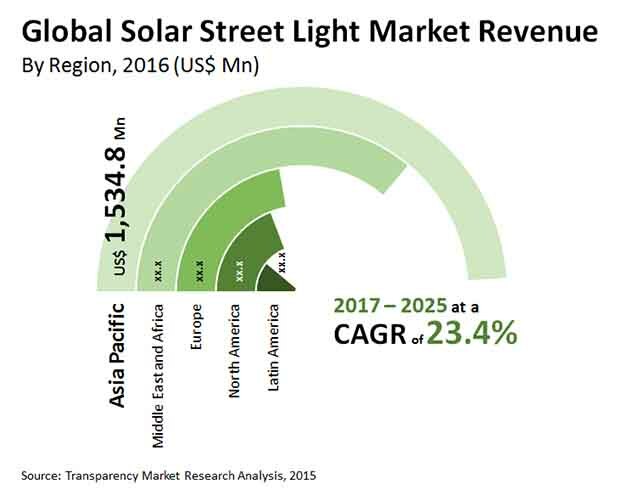 The diminishing resources used for the production of power or lighting across various industries have brought solar street lighting market under the spotlight of recognition. Governments across several regions are propagating the use of solar lighting systems which has increased the demand within the market. The government initiatives have led to the installation of these systems across streets, traffic intersections, subways, recreation parks, and other public places. The global uprising towards the usage of renewable sources of energy has powered the solar street lighting market, giving a prominent push to the market. Besides, the renewable energy sources employed in these systems significantly reduce the costs of power generations, thus, addressing the concern regarding high costs of power supply. The industrial uses of these systems have also surfaced in recent times that adds on to the bright prospects of the market. Furthermore, the awakening amongst the people for the use of greener solutions has expanded the reach of these systems to the residential sector as well. The various types of these systems offer ease of operation due to the safety of charging the batteries and their tractable nature. The market in Asia Pacific offers commendable growth opportunities owing to a zeal to employ greener solutions across the region. This offers great opportunity for the market and creates demand for various types of solar lighting systems. The developing countries in the Middle East and Africa are also showing proclivity towards solar sources of power generation. This further elevates the demand within the global market for solar lighting systems. Moreover, the high toll of unmet power needs in these regions is also a standpoint of importance for the market. Even developed nations such as North America and Europe are likely to bolster the market with their increased efforts towards solar usage.